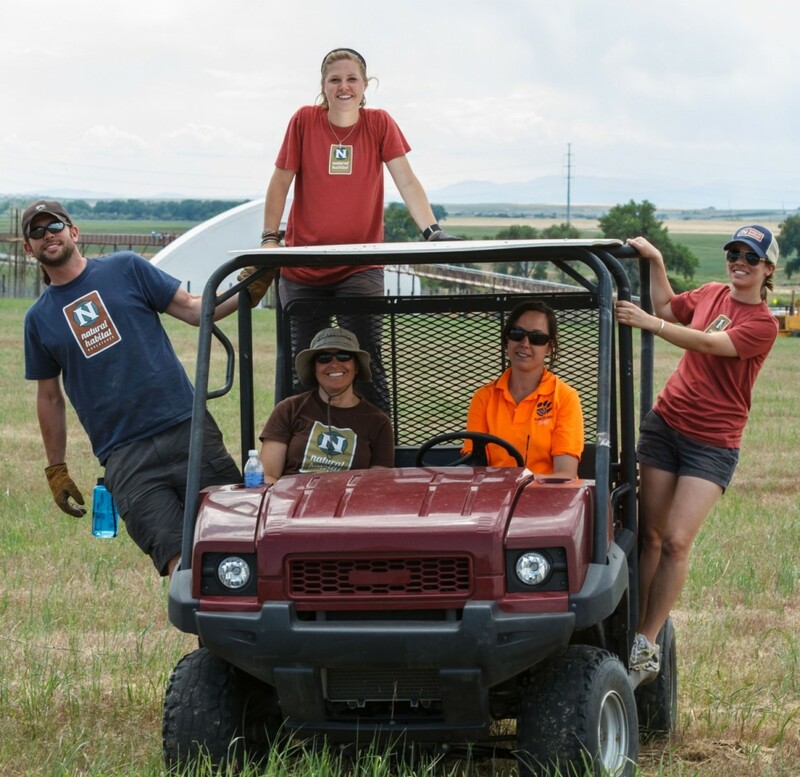 Nat Hab staff had such a great experience volunteering at Colorado’s Wild Animal Sanctuary last year, we decided to return again for one of our semi-annual staff volunteer days! 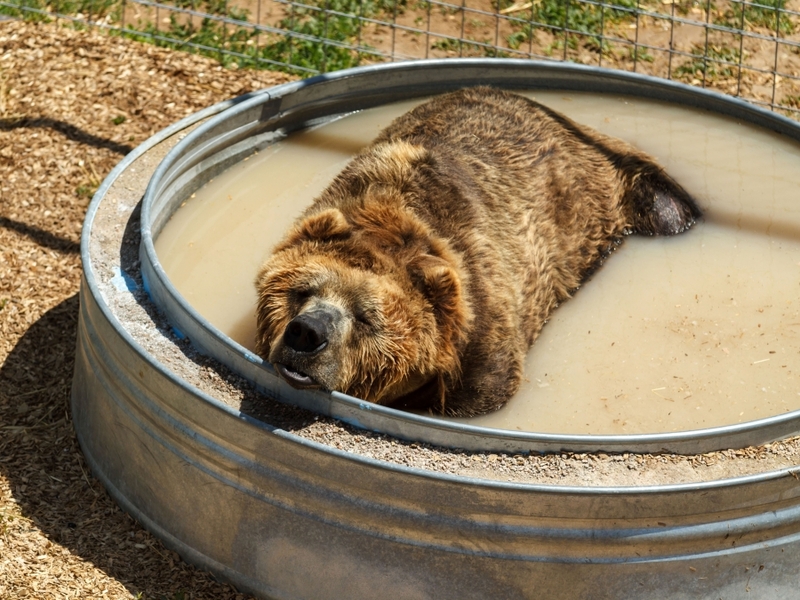 The Wild Animal Sanctuary is the United States’ premier rescue facility for large wildlife that has been abused, abandoned, exploited or illegally kept. We are incredibly lucky that the Nat Hab headquarters is less than an hour away from this amazing wildlife refuge. It is surreal to see the world’s largest carnivores prowling through the Colorado prairie with the Rocky Mountains in the background. 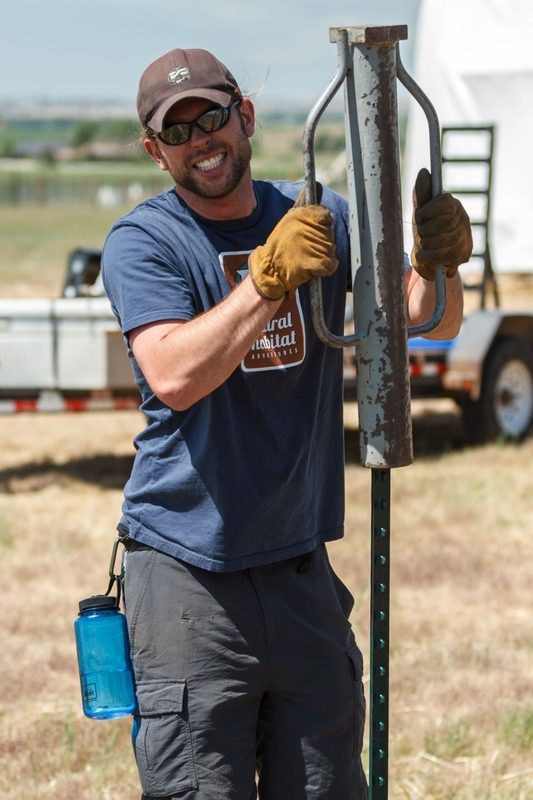 Although we enjoyed sorting donated meat last year, we were thrilled to try out a new project this year, building a fence on a sunny Colorado day. We met this rare white tiger soon after stepping onto the boardwalk. 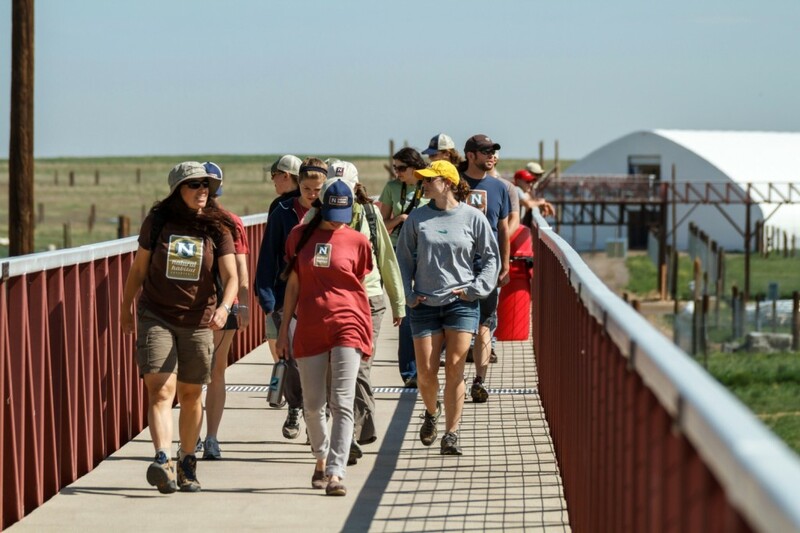 Before we got our hands dirty volunteering, we took a tour of the “Mile into the Wild Walkway,” a one mile observation boardwalk that allows visitors to view the wildlife in their habitats at a distance that is comfortable for the animals. On the tour, we learned that The Wild Animal Sanctuary is the largest facility of its kind, set on 720 acres and home to over 350 rescued animals including tigers, African lions, black bears, grizzly bears, mountain lions, leopards, wolves, servals (do you know what a serval is?! ), bobcats, foxes, lynx, coyote, coati mundi, raccoon, porcupine, ostrich, emu, and camel. 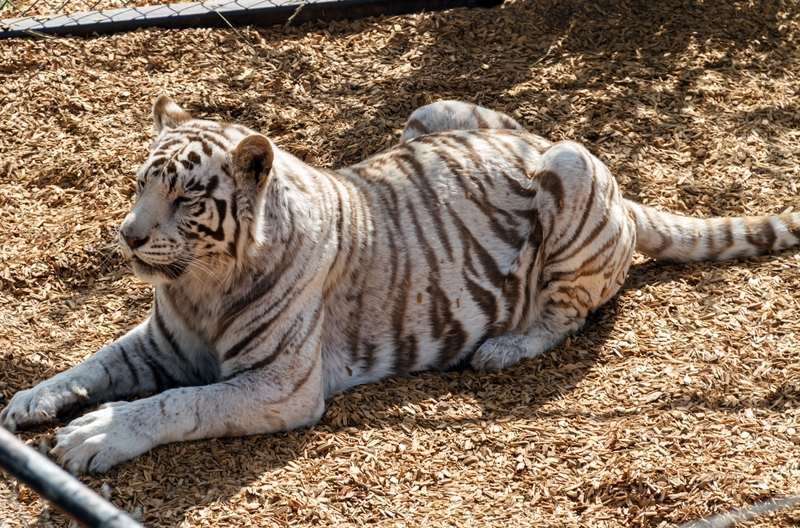 The majority of the animals at the Sanctuary were rescued from people who tried to illegally keep exotic animals as pets, while others were surplus animals from zoos and circuses guilty of over-breeding. The Wild Animal Sanctuary has made over 1,000 animal rescues from 45 states and from many countries including Canada, Mexico, Panama and Bolivia since it opened in 1980. Exotic animal trade is a serious issue – during our tour we learned that it is the USA’s (and the world’s) third largest source of illegal profits after illegal drugs and weapons. We were also astounded to learn that more tigers are living in captivity as “pets” in the state of Texas alone than there are currently living in the wild in the rest of the world. There are as many as 15,000 Big Cats living in captivity outside our zoo system in the US, and the vast majority of these animals in private hands are living in filthy, inhumane situations. 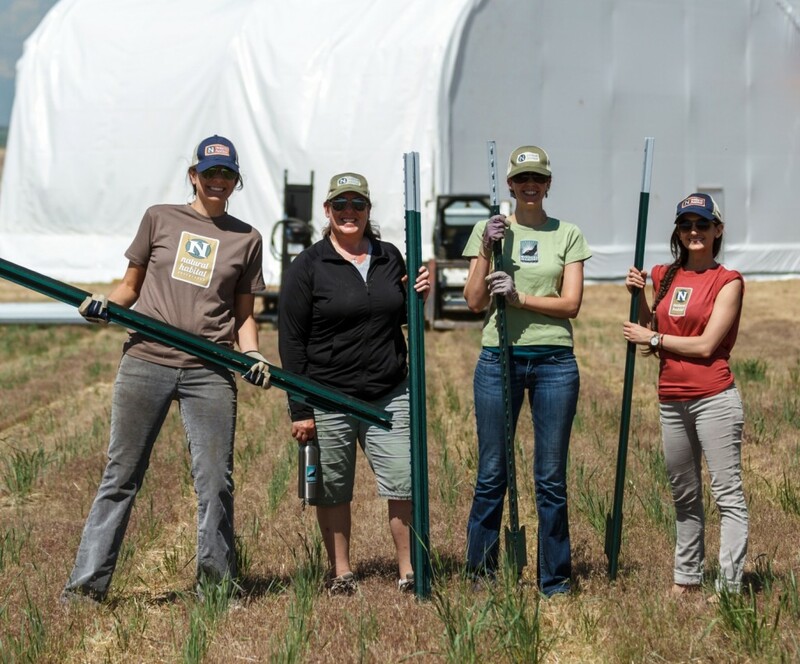 The Sanctuary depends on volunteers like us and donations from companies like Walmart, who donates 20,000 pounds of just-expired meat per week! It’s one Sanctuary’s full time job to drive around to 28 different Walmarts to pick up all that meat every two days. This Kodiak grizzly bear is one of the newest additions to the Sanctuary family, rescued from Florida with two other grizzly bears just two weeks ago. At 1600 pounds, he is twice the size of any grizzly bear they’ve rescued in the past! He loves lounging in his pool on hot days. The epitome of friendship! These lions are part of a group of 25 African lions that were rescued from Bolivia after a nation-wide ban on using animals in circus performances was enacted, and 8 circuses refused to comply. These four are such good buddies they are all kept together in their own pen. To expand its educational reach, the Sanctuary is holding its first-ever “Rock Into the Wild” summer concert series, with free Woodstock-style outdoor concerts this June, July, and August. Nat Hab staffers got to flex our muscles building a fence around the perimeter of the concert area. 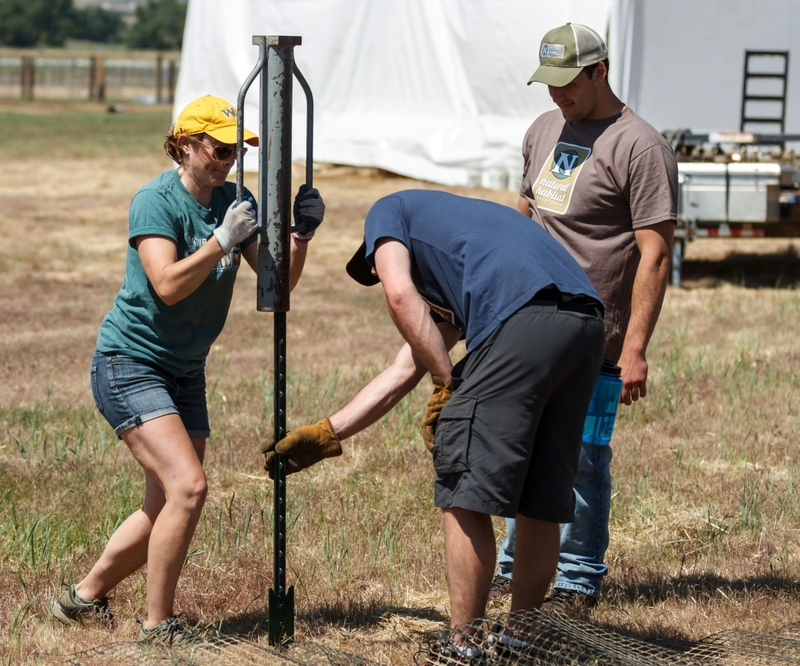 We became expert stake-drivers, as we toned our triceps driving hundreds of heavy fence poles into the ground. If you happen to go to any of the concerts, take some time to appreciate how sturdy the fence is! 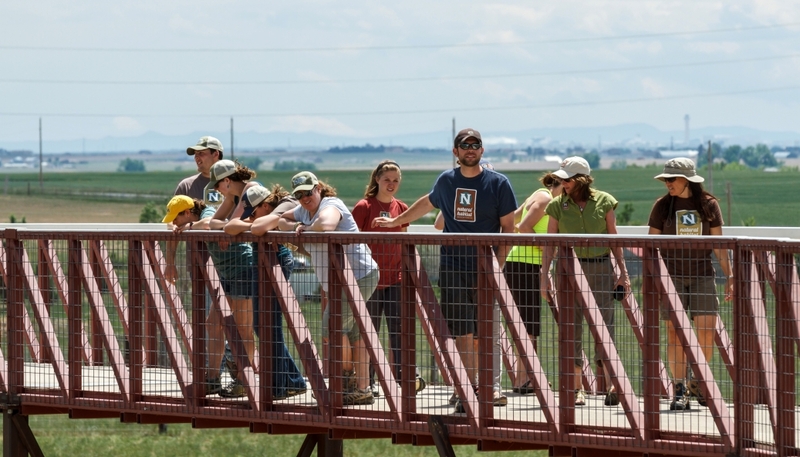 The fence we built extends right up to one of the Sanctuary’s larger lion habitats. 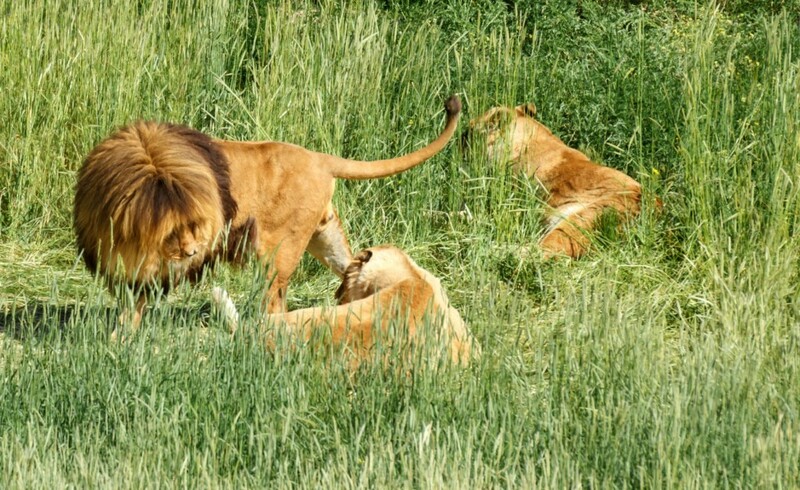 When the lions heard us pounding stakes into the ground they moseyed right over to see what all the commotion was about. Don’t worry there were two large professionally built fences between us and the lions. Can you imagine watching an awesome concert on a beautiful summer night with four lions crashing the concert just a couple hundred yards behind you? Sounds like our idea of a great night! Part of the finished product! After all the hard work was completed, we rewarded ourselves with some ice cold beers. 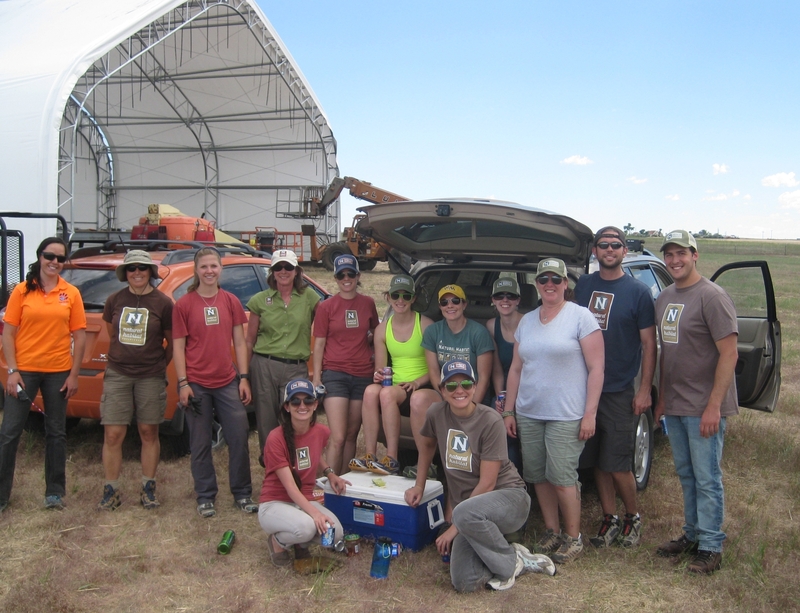 We don’t want to wait a whole year to go back, so don’t be surprised if you see some staff rocking Nat Hab gear at the Rock Into the Wild concerts this summer, and make sure to say hi! 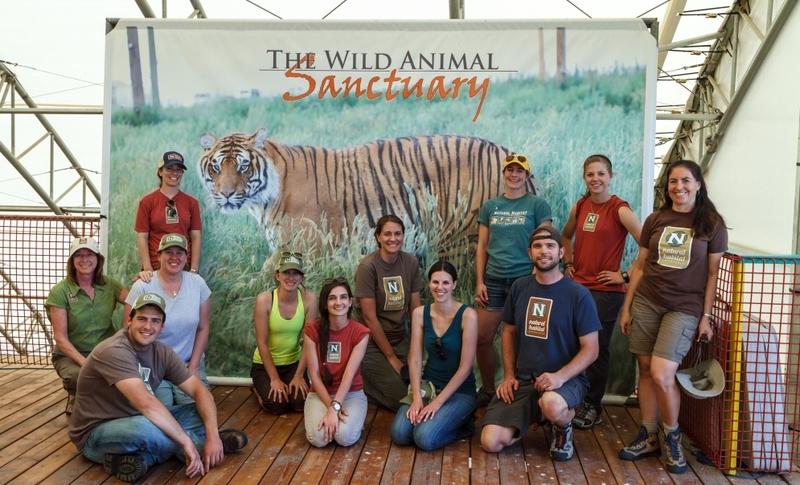 A special THANK YOU to our fearless leader, Wild Animal Sanctuary volunteer coordinator Jenny Weisshaupt, for helping make this day a success! To learn more about this incredible animal rescue facility, the wildlife that call the Sanctuary home, and how you can help, check out their website. Next time you’re in Colorado, make sure to visit them, it’s well worth the trip! 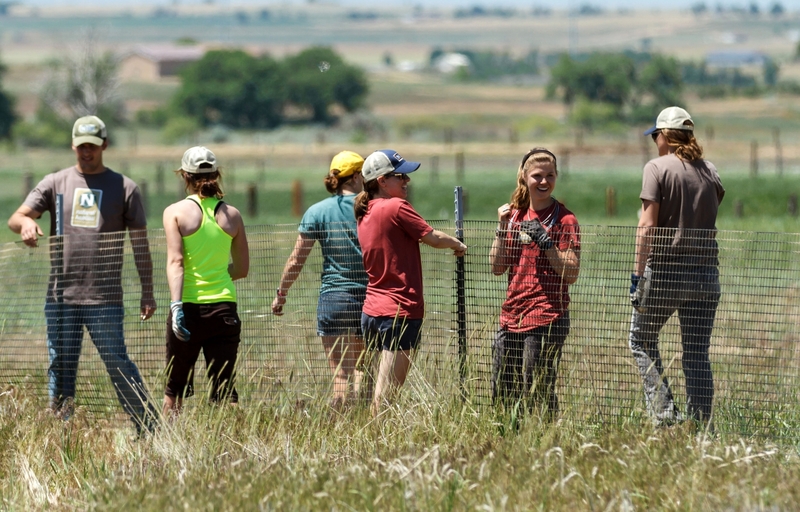 If you live in Colorado, you can plan a group volunteer day of your own! The Wild Animal Sanctuary is definitely the best way to view exotic wildlife, unless of course you’re joining one of Nat Hab’s Alaska grizzly bear tours or one of our African safaris! Check out that perfectly coiffed mane! These were the lions who came over to check out our fence-building skills. Taking one more stroll to watch wildlife after our work was done. WOW!! Awesome article, actions, and photos! You guys are great!